You don't have to send people away -- we have all that stuff on our site. No helping the NCAA; remember, they're the enemy. Oh, I'm sure that all the ads that display on that page will go directly into the Division III NCAA Tournament traveling fund. I did get to the WPI-UMD game on Saturday. UMD came out hard and got WPI to turn the ball over numerous times early in the game. WPI managed to stay within striking distance, but was never able to overcome that early deficit. NT Izuchi kept WPI in the game going 3 for 3 from outside the arc in the games first 10 minutes or so, but only took 1 more shot during the rest of the game. While WPI never seemed to find a go-to guy on the offensive end, UMD had 3 of them. Reece Freeman, Matt Walker & Brandon Shelton played great to carry UMD to the Sweet 16. Walker had an amazing game going 9-9 from the field including 2 3's. Freeman went 8 for 11 with 5 assts and Shelton was 6-12 and 4 out 5 from the free-throw line. Another player who stepped up and hit crucial shots in the second half was Tom Henneberry. His 2 three's each came at points where WPI had a chance to cut the lead under 5. WPI had several opportunities to get the lead less than 5 points, but every time they got there, someone on UMD stepped up and made the big play. UMD got a little sloppy committing 7 turnovers that helped to keep WPI close, but it was not enough for the Engineers to overcome a 16-2 differential in points off turnovers in the 1st half. WPI was led by senior Adam Lirette's 12 points and 3 assts. Jeff Robinson & Fernando Perez added 11 each. Seniors Izuchi & Jerome Kirkland tossed in 9 and 7 points respectively. The matchups favored the quicker Corsairs for most of the day. The only advantage WPI had was some height inside, where Bennett Lessard posted 6 points & 5 rebounds, but he only played 17 minutes and his back up did not play at all. Perez did get a few scoring opportunities inside, but he only got about 4 of his 7 shot attempts from the low post offense and only took 2 shots in the 1st half. In the end, UMD actually outscored WPI 38-32 in the paint. In the second half, WPI went to a different kind of defense where they had Lessard playing UMD PG - Reece. He was playing off him, sagging back into the paint giving Reece the 15 foot jumper. This did seem to throw UMD off for a short time, but late in the game Reece started driving the lane and came up with a layup that bumped the lead to 9 pts and then the final dagger when hit a short jumper with 1:20 to go that pushed the lead to 8 and WPI never got that close again. WPI did a good job to come back and stay in the game after looking very shaky at the outset. Unfortunately for the Engineers, UMD had too many weapons and just shot the lights out going almost 60% from the field (48% from 3 land). UMD is now 27-3. WPI finishes another very successful season at 21-6. 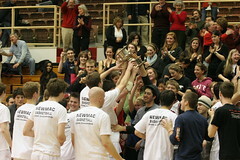 I see that MIT lost as well, but what a great year for the NEWMAC. Two teams into the tournament and both picked a win! Congratulations to both teams for giving us some great basketball to enjoy this year! Congrats on Great Careers (Billy Johnson should be back for year 5, and will get on a lot of the career lists if he does). I believe the MIT class of '09 also holds the MIT record for most wins in a 4-year span at the Institute. Thats very possible. They were involved in both 21 win seasons. This was a game of runs, as each team held leads in each half. FSC had a strong run just before crunch time in the second half. MIT had the ball with :38 left in the game, trailing by 2, but things didn't go the way they wanted in their final possessions. The game was just as close and as intense as the MIT-RIC game, and either team could have won this one too. The refereeing was bizarre, letting FSC grab and hold jerseys w/o a whistle, letting FSC go over the back and be given a held ball call, yet when 2 guys are jumping up for a loose rebound MIT gets whistled a foul (?). Lastly, I have to say Brad Gampel absolutely played his heart out in this one. He was all over hustling, rebounding, doing everything anyone could do to win this game. He left it all on the floor. If anyone watches the archive video, you'll see what I mean. Yeah, that traveling call wasnt so great at the :38 second mark when MIT was down two. The reason Bender bordeline traveled was because a defender raked him across the arms when he was going up for a shot (or pass, wasnt clear), and then the ball came out of his hands before he landed (so it should not have been a traveling anyway). I"m curious what happened to WPI freshman Jerome Stewart over the last 6-8 games of the season. He seemed to get buried on the bench after starting a bunch of games and getting significant minutes over the first 2/3 of the season. He seemed to play well, albeit inconsistently at times, in the games I saw. WPI could have used some of his inside toughness against UMD on Saturday, but it appears that once you get on the long end of Bartley's bench it takes a long time to earn back your minutes. To his credit, he was a loud and positive cheerleader for his teammates from the bench Saturday night. I thought UMD's Freeman was outstanding on Saturday, not only penetrating to the hoop at will but grabbing key rebounds and steals on the defensive end. He's a lot of fun to watch and the key to UMD's defense. The UMD press is one of the best I've seen, one you really can't prepare for, and the kids execute it extremely well, a credit to the coaching they get from Brian Baptiste. I checked into this (all numbers are for since 1960) and this class does have the most wins by a 4 year class (68). They also have the best winning percentage (0.602), and the first over 0.600, since the class of 1968-69. The best winning percentage of any class was the class of 1966-67, winning 71.3% of their games. To the credit of Coach Anderson, this is the 7th year in a row that a graduating basketball class has had a winning record at MIT, and 8 out of 9 of at 0.500. Prior to that, (1999-2000 and prior) there had been 30 consecutive classes with losing records. Definitely a tribute to Coach Anderson and his disciplined system. Huge---- will you predict that Coach Anderson is going to be wined and dined by some other schools' AD's who are looking for a really good basketball coach? I have no idea, I havent heard or even thought about that. From what I know Coach Anderson is happy. With that said, if I had a coaching vacancy, I would want Coach Anderson leading my team. I think the circumstances would have to be perfect for him to leave, though, I cant see it happening, but you never know. Plus, at what other university could he say his a Professor at MIT (he has the official title of associate professor, other titles include Head Men's Basketball Coach, Director of Club Sports, and I think he has some other position in some aspect of student life). It is pretty spectacular what he has done. He didnt have enough players to practice 5 v. 5 the whole season, yet he always gets the most out of his players. I have seen quite a bit of d3 basketball over the past 8 years and Coach Anderson runs the most disciplined teams I have seen, period. The three seniors deserve a lot of credit, but without Coach Anderson's defensive emphasis and the intelligent, deliberate way he approaches coaching, I dont think this team sees nearly as much success as it has. I hope he gets a lot of consideration for NE coach of the year and even national coach of the year. I think with him at the helm, and the recent interest in the program due to its success, MIT could become a perennial 20 win team. Its just a matter of getting players admitted and whether those players are committed to basketball, as well as academics. I was always impressed with Coach Andersen--such a class act. You can see it everything he does from the beginning of the game til the end when he talks with his own kids and other kids and fans at the game. He has done a lot and deserves only the best. Congrats to MIT on a great season! By the way, what is Coach Andersen a professor of? I wonder if you could audit his class.